It all started young. As a kid on a farm, this Ohioan developed his passion early. A caring mother sensed the talent, giving her young son a guitar at 12 years old. Dad followed through with the lessons. What shadowed was the learning curve of a hard road of tip jar bars and late night smoky honky tonks. Jump forward to now. Newcomer Ryan Broshear has released his self-titled debut. The apprenticeship has paid off, with an album of 10 tunes drawing solid industry interest. With a voice many review writers liken to Tracy Lawrence, Broshear is gaining in popularity with a sound that spells New Country and promises take notice excitement. Broshear not only has an arsenal of smooth looks, with a countrified voice to match, but the guy can write. And he writes good, bankable fan and radio tunes. The mark of a good album, any album, is the “repeat” factor – how many times do you want to hear it again? This is high rotation country. The album kicks from the first track. Across all the self and co-written (wife, Amie Broshear) tunes,“I’m Rich” is a knockout. The now-at-radio cut, powered by a tight band of seasoned players (Joe Nichols’band), has the needed quality to be a break-through hit. The strum-fueled twang tells of “though I’m back in the ditch… I’m rich”. The inspirational tune savours the need to overlook the lost for the favour of what you’ve got. It’s a sure-fired dance favourite for Saturday night revellers. With not a filler in the album pack, Broshear mines emotion and listener involvement, both with equal skill on this Daniel Agee produced, and Curb recorded, release. “Let Your Redneck Out” is a Wurlitzer-laced anthem that is sure to fire crowds with a voice to be heard. For refection, “I Don’t Mind” is a sober tone with a tale of self-examination, while “Damn Good Place To Start” is a mid-paced mover telling of lost nights, too much alcohol and too many memories. Not forgetting his roots, Broshear pays musical homage to his heroes – Johnny, George, and Merle – on the fitting album closer, “Countrything”. 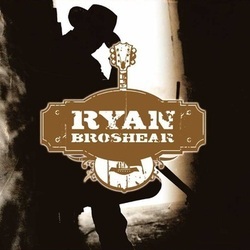 With a growing Facebook fan base, a loyal following on YouTube, and an album that is filling a diary of shows, Ryan Broshear may just be someone to follow in 2012. Certainly, we think so.